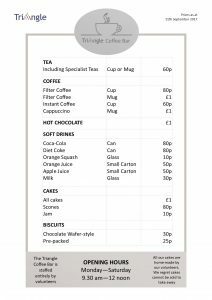 Serving hot and cold drinks alongside delicious homemade cakes and biscuits, our coffee bar is the ideal venue for your next social event. Staffed entirely by volunteers, our coffee bar is open between Monday - Saturday, 9:30 - 12 noon. Below is our current menu offering, please click the image to enlarge. To book your place in the Community Help Day calendar, please contact us. If you are able to give The Triangle 3 hours of your time once a month 9am - 12 noon we'd love to speak to you! Please contact our office on the details below. We are pleased to announce that we are now able to offer a catering service to our customers. 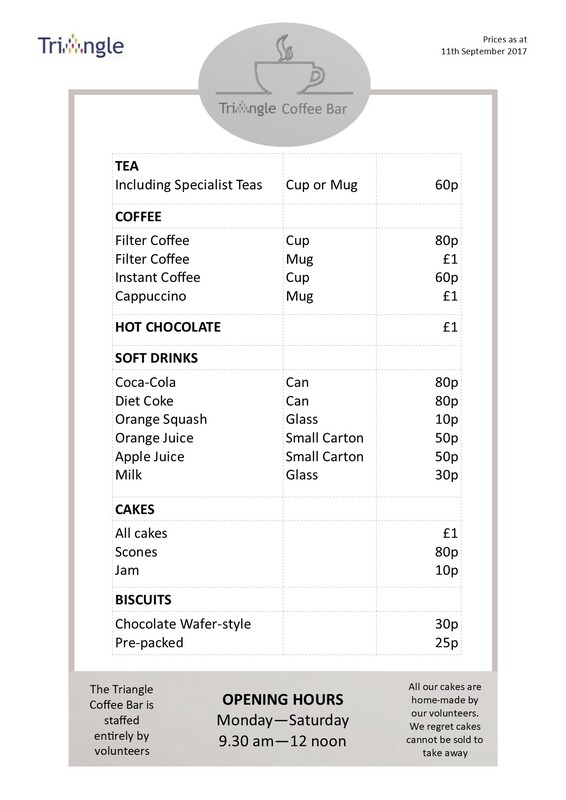 We can provide hot drinks with cake and biscuits along with a cold buffet for business lunches, meetings or events.